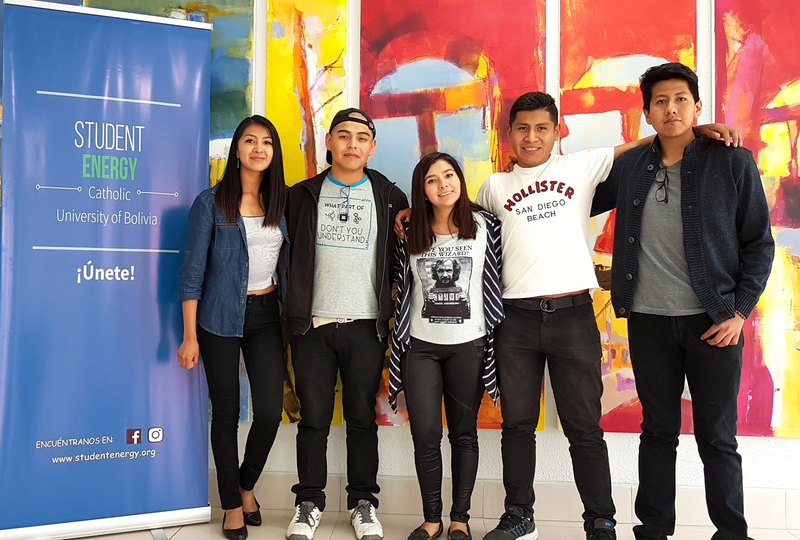 Student Energy at Catholic University of Bolivia is a chapter of the Student Energy organization. We want to work in coordination with different chapters worldwide and with outstanding institutions in the energy sector, environment and public policies. We seek to promote the development and positioning of sustainable energy in our environment, by strengthening young leaders in the energy sector. We want to ensure that young people have the tools to learn, develop and share ideas, projects and experiences that promote the sustainable development of energy at a national and global level. For this, our team carries out different activities that involve young multidisciplinary students, such as conferences, debates and much more. The idea is to get in touch and develop activities in the most dynamic and profitable way. We want to work as a team to accelerate the transition to sustainable energy. Be part of the Movement! Co-founders: Nassia, Marco, Grisel, Christian, Mario, Jose, Diego. Check us out on Facebook, LinkedIn and Instagram.